2Wheel Chick: Oh, those Corners !! The good news is I finally managed to get out and do a road race. The bad news is that it was on a very technical circuit and I couldn't manage to stay with anyone. It's been a while since that happened to me. The plan had been to break myself back into road racing gently. To start off by doing races on non-technical circuits, probably with 3rd and 4th cat men. The racing would certainly be fast with them, but the fact that I'm in with the blokes means that in racing terms I have nothing to lose. I'm not expected to win or earn British Cycling points, so it doesn't matter what I do ! 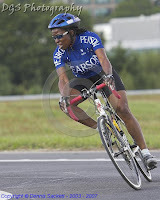 I can experiment with things, or just practice riding my bike fast and getting comfortable in the peloton. The Surrey League handicaps are always a good start point. The courses are flat and non-technical. They set riders off in groups of similar abilities, and you all work together to stay ahead of the faster groups. As the slower groups get caught the peloton becomes bigger and you do less work as the drafting effect is stronger. So by the end of the race you're whizzing along at near 40km/h without too much effort. Real exhilarating stuff. This week's handicap took place in a new venue. The Mercedes Benz World site at Brooklands, near Weybridge. I had no idea what it would be like. I'd assumed it would be another racing track circuit like at Goodwood, or Thruxton. It would be pan flat, though maybe a bit windy, and apart from one chicane, non-technical. In fact it was only one of the above ! It wasn't windy, there was no chicane, and it was very technical. It was flat though. The fact that their web-site describes this place as somewhere to come for great driving experiences should have given me a clue that there would be some fun and games on the course ! My train from Esher, near where I work, was late, so I ended up getting there in a mad rush. In fact, I missed my group start, so just set off with the next group. I hadn't recced the course, though was not worried. But then I suddenly came up to a 180 degree bend, followed by another one, then two 90 degree bends, and another 180. What was going on ? It was like being on a fair ground ride. Was someone taking the p1ss ? I'd set off with Dave, a guy from Team Trisport News and we got chatting. But the chat didn't last long at all as he very quickly dropped me on the bends. Once on the straight sections I was able to push a decent speed, but very soon we'd hit another series of bends, and I would slow down again and lose the people I was with. Many of these riders will have raced the tight corners of Crystal Palace or Eelmore so will have grasped the principles. Today was my first bit of serious cornering this year. And it was a baptism of fire. If you're good on corners this course is a bit of a tester. If you're ok, this course is challenging. If, like me you are rubbish on corners, you might as well pack up and go home. Many people came past me. And although I was able to keep with them for part of a lap, sprinting out of the saddle to keep up with them, I would soon tire myself out and lose contact. I resigned myself to this "race" becoming a cornering training session. Where else would I find this many corners in a one mile circuit ? I was pleased to finish the race (many didn't) and spectators commented that my cornering improved during 75minutes of racing. The race didn't finish with the characteristic massive peloton, like other handicaps - instead it was just various groups of riders, as the course had done a good job in shattering the peloton. Hopefully we will come to know and love this circuit in the coming months !